Prosecutors say computer equipment at Geneva venue was infected with espionage malware but they had to close the case. A number of computers at a five-star Geneva hotel that has hosted sensitive talks, including Iranian nuclear negotiations, were found to be infected with malware used for espionage, Swiss prosecutors have revealed. But the state prosecutor’s office, OAD, has had to close the case after failing to establish who was behind the cyber-attack, a spokesperson said. 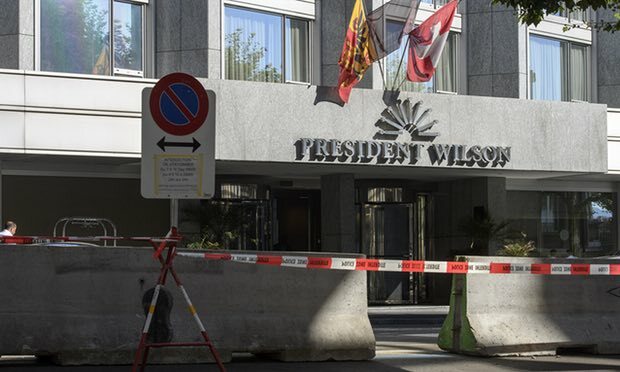 The hotel, believed to be Hotel Président Wilson, which is famous for its 1,680 sq metre presidential suite, was raided on 12 May last year after OAD had launched an investigation over suspicions of illegal intelligence services operating in Switzerland. “Investigations revealed that a significant number of computers [servers and clients] at a hotel in Geneva had been infected with a form of malware,” the state prosecutor said in a statement on Thursday. André Marty, a spokesperson for the Swiss state prosecutor, told the Neue Zürcher Zeitung newspaper that investigations would be relaunched if new evidence emerged. In Vienna, where the Iranian nuclear talks concluded in July 2015, the state prosecutor has launched two separate investigations into possible espionage. A spokesperson for the justice ministry told the Guardian that the two ongoing investigations were launched in June 2015 after bugging devices were discovered at Palais Coburg. The long-running nuclear talks were a magnet for the world’s intelligence agencies as they sought to find out more about the Iranian nuclear programme and the negotiating positions of the six nations involved. When the talks shifted to a luxury hotel in Vienna, the microwave radiation from the surveillance efforts of competing intelligence agencies was so intense that diplomats had to walk some distance from the venue to use their mobile phones. The US secretary of state, John Kerry, would take walks with his Iranian counterpart, Mohammad Javad Zarif, in what was seen as a publicity stunt, but which was also a practical means of dodging electronic bugs. When diplomats attending talks in Lausanne wanted to call their capitals, they would stroll around the grounds of the venue, another five-star hotel, rather than call from their rooms. The Israeli government, which strongly opposed the nuclear deal, last year denied accusations of espionage after a Moscow-based security firm said a computer virus believed to be used by Israeli spies was used to listen in on the talks.